Pencil, pen & ink, watercolour, and black & gold marker pen on paper. 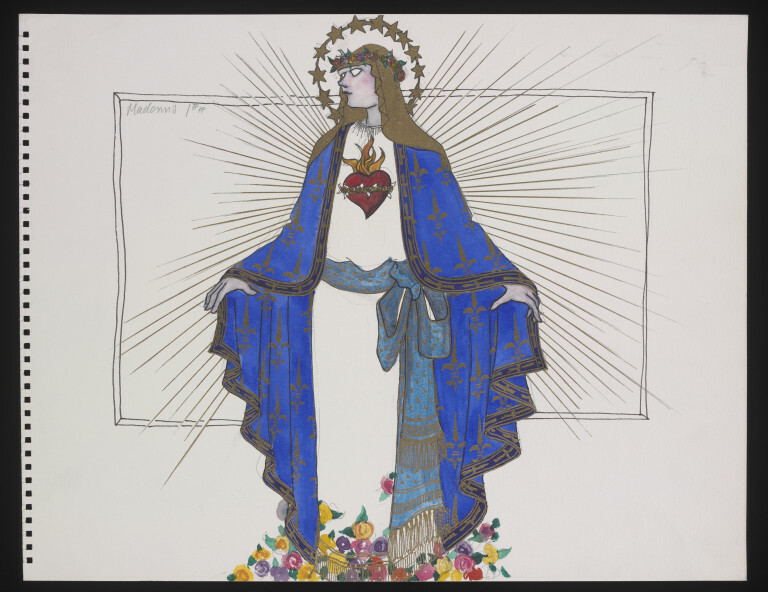 Costume design for the Madonna. The design depicts a full length female figure wearing robes associated with the Virgin Mary in Catholic iconography. The costume consists of a blue cloak decorated with gold patterns, worn over a white tunic, bound at the waist with a light blue and gold scarf . The figure also wears a gold veil on her head crowned with a wreath of flowers, and has a halo of gold stars above her head. The figure stands on bank of flowers, and gold rays extend from her body. Unsigned by the artist. This costume design by Lez Brotherston is part of an extensive collection of designs donated to the Theatre Museum by the artist in 2002. The design was executed for a production of Siegfried Matthus's opera "Cornet Christoph Rilke's Song of Love and Death" performed by Glyndebourne Touring Opera at Sadler's Wells on October 4th 1993. The production was translated by Bernard Jacobson, directed by Aidan Lang, conducted by Martin Andre, and lit by Davy Cunningham. 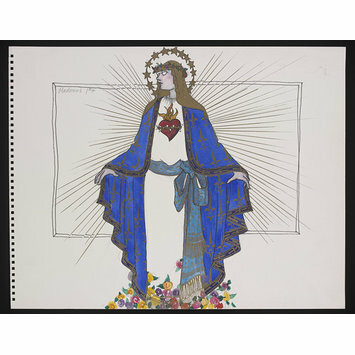 Costume design by Lez Brotherston for the Madonna in the opera "Cornet Christoph Rilke's Song of Love and Death", Glyndebourne Touring Opera, Sadler's Wells, October 4th 1993.